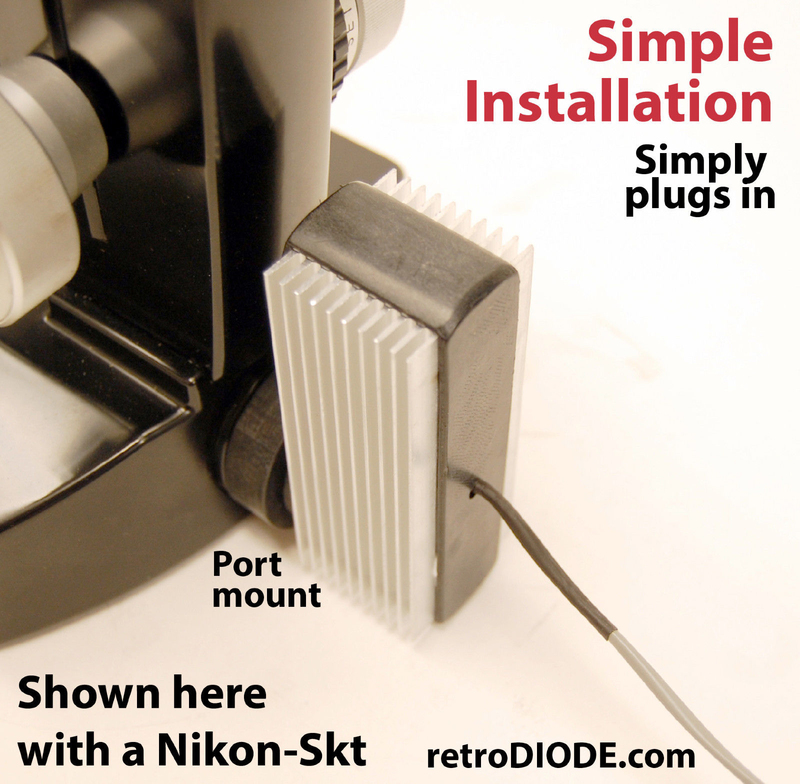 In Part I of this series, we talked about a simple, home-grown fix for a defective, very basic illumination power supply on one of the most classic of classic microscopes, the Nikon S. Then in Part II, we moved on to repairing or replacing the more sophisticated supplies for incandescent lights on modern scopes from about 1975 onward, and met the ubiquitous switch mode power supply, or SMPS. In this segment, we will review the ultimate, and perhaps best, solution for repairing or updating illumination on a classic microscope: LED conversion. Rather than rebuild an older incandescent light source, the most expedient solution may be to upgrade it to LED illumination that provides bright, white-light illumination with a durable system using little current, producing minimal heat, and using no expensive, hard-to-find replacement bulbs. 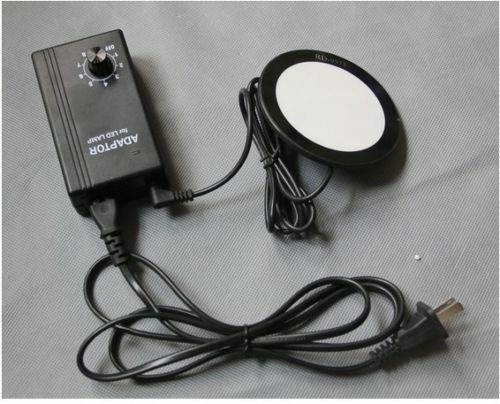 You can buy a readymade LED illuminator for some microscopes. For many classic scopes, however, there are no off-the-shelf solutions, and you are faced with modifying the illumination system yourself. This not necessarily a bad thing – in some cases, the conversion can be done fairly cheaply and easily using pre-built power supplies or a simple battery supply. Many, if not most, modern microscopes have LED illumination systems. Aftermarket LED illumination kits or adapters designed for a number of specific microscopes have recently become available. A Google search for microscope LED illuminators and light sources brings up a variety of retrofit kits and illuminators, a number of which are generic, of Chinese origin, and may or may not be a good fit to specific models. The most sophisticated yet cost-effective manufacturer of LED retrofit illuminators for older scopes seems to be retroDIODE LLC of Gardner, Kansas. 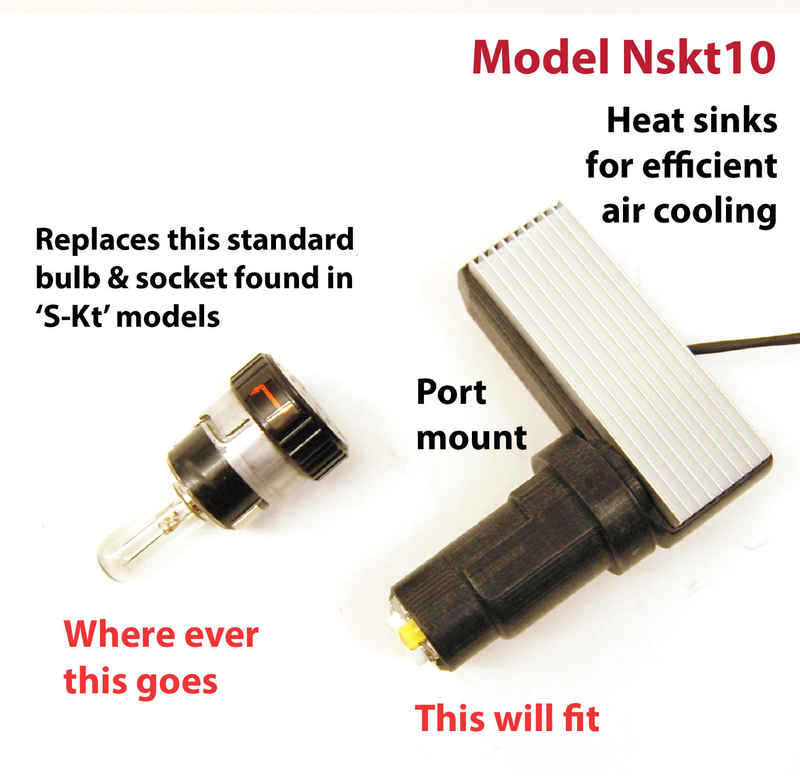 This manufacturer uses 3D printing to manufacture LED units specific for a number of the most popular classic scopes; this is their unit for the Nikon S-Kt: At $140.00 US on retroDIODE’s eBay store, this seems to be a reliable and reasonably-priced alternative to building an LED illuminator from scratch. Promicra also makes some LED illumination systems, but no price is given, and the cost is probably significant. ThorLabs manufactures very sophisticated microscope light sources in a considerable variety of well-characterized spectra for several major brands of scope, but the price is about $450-600 US, and they are only made for fairly modern microscopes. Similarily, eBay carries a multiplicity of ring LED illuminators for stereomicroscopes at very reasonable prices. The main advantage of buying a commercial LED conversion kit is that you don’t have to mess with deciding on the best LED, choosing a power supply, using tools, tearing out the old system, or making the new system. However, LED conversion kits are not yet available for all vintage microscopes. Furthermore, with some ingenuity, a conversion can be done for very little money, and you then have the satisfaction of understanding your equipment better (and deciding what to do with all the money you saved). MAKING YOUR OWN ILLUMINATOR: WHAT IS AN LED? vacuum tubes, the work of this unsung genius was largely ignored. 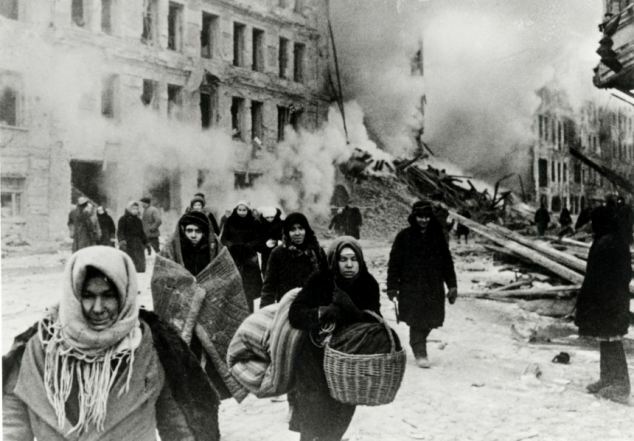 Caught in the siege of Leningrad in 1941, he tried unsuccessfully to get a paper on a three terminal semiconductor (possibly the first transistor) out of the besieged city, but the manuscript was lost, and he starved to death in 1942, along with a million other residents of the city. 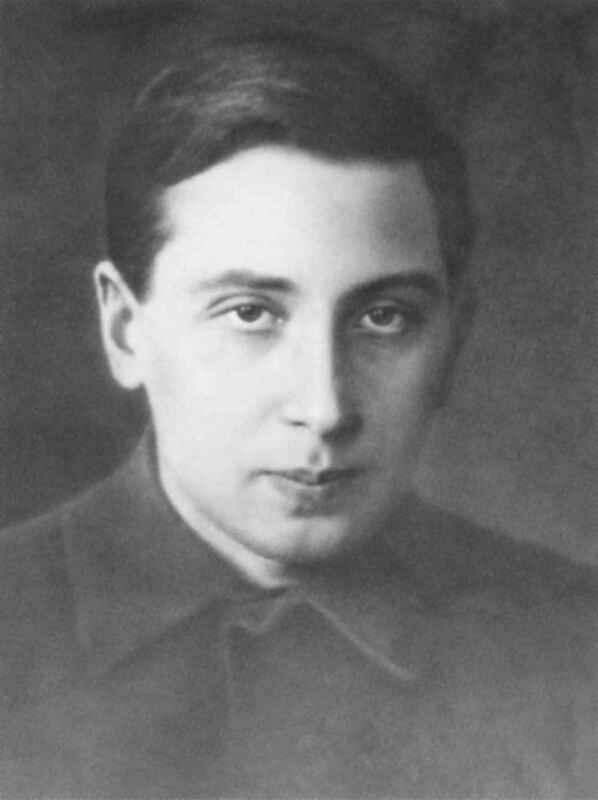 Lesov spent much of his life working as a lowly technician, and his work was forgotten for twenty years. Nikolay Zheludev and Tom Simonite have published fascinating notes on Lesov and the original development of the LED. Most sources unfamiliar with Lesov’s work credit the invention of the LED to the independent efforts of four American research groups in 1962 (see Wikipedia article); subsequent intensive work by many groups led to the first commercially successful LEDs in the 1970s, and there has been an enormous volume of research and innovation since that time. HOWEVER, not all such transitions, and not all semiconductor types, produce light. Asking “…But…but…why?…” leads the reader into arcane theory and dark places that are better left alone. Anyone who lacks a strong stomach and a knack for dealing with quantum entities that don’t really exist but still can go bump under the stairs, is advised to take two Dramamine, sign off the computer, and lie down in a quiet place. The less wary will learn that the energy drop across the junction is referred to as the band gap; gaps are classed as direct or indirect depending on whether the direction of the crystal momentum vector of the electrons and holes in the valence and conduction bands bands is the same or different, respectively. If you don’t understand that, don’t feel badly – the crystal momentum vector is only a virtual vector, so it isn’t really there anyway. Delving further, explanations of semiconductor junction physics descend into pages of little squiggly things that would look nice on a wall, but tend to produce headaches. For those who would actually like to explore this topic further, the Wikipedia article on electronic band structure is quite good. What this means in a practical sense is that some semiconductor junctions can produce light and some can’t. Charge carriers (electrons and holes) in those with an indirect band gap go through an intermediate energy state (rather like a pinball bouncing around) and dribble their transitional energy away into the crystal lattice in the form of heat – this occurs with silicon and germanium. 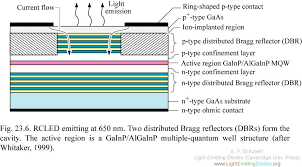 With a direct band gap, charge carriers make only one transition, giving out a nice photon as each carrier makes the jump – gallium arsenide crystals do this, as do crystals of aluminium gallium indium phosphide. The color of the emitted light can be changed by doping the semiconductors with impurities to adjust the width of the band gap. The Wikipedia article on LEDs has a nice table of semiconductor materials and their respective spectra, as does the Zeiss site. Once you can produce light from a semiconductor junction, how do you get it out of the junction and focused into a beam that is useful? Actual LED chips are tiny, ranging from 1/10mm to 1.0mm in size. Most commonly, they are mounted in a small reflective cup on one of two supports, the anvil, or cathode. 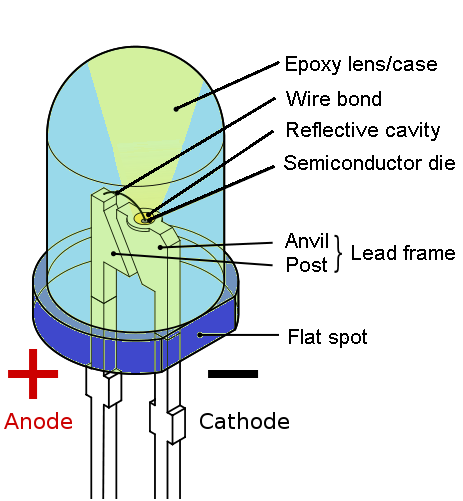 A fine metal contact wire from the post, or anode, connects to the surface contact of the LED. These internal components are sealed in an epoxy case with an apical lens that concentrates the light reflected from the cup into a beam of predetermined width. Unlike the simplistic pictures of junctions, the structure of an actual LED is quite complex, and reflects thousands of hours of corporate and academic research, published on thousands of pounds of paper, and wrangled over at hundreds of annual conferences. Different manufacturers have different designs, and the average LED is a highly engineered multilayer device. These images provide only a taste of the many variations in LED design, and advances in LED micro-engineering are occurring on an almost daily basis. Remember that all of this structural work is occurring in an object about the same size as the head of a small pin. Any body at a given temperature will emit the same spectrum; for this reason, the color of light bulbs or other light sources is often expressed as a color temperature. Midday daylight is roughly equivalent to the light from a heated body at about 5600 degrees Kelvin. Note also that black bodies like light bulbs are hellishly inefficient producers of visible light, with most of the energy output occurring in the invisible and useless, long-wavelength far reds and infrared. Consequently, most of the energy from the batteries in an old-fashioned flashlight is wasted in producing heat. For balance, the reader should also review David Walker’s superb article in defense of tungsten illumination. His images of denser objects taken with near-infrared illumination are striking; these would be difficult to accomplish with the narrower spectrum of present-day LEDs. His compilation of creative ideas for illumination on the Biolam microscope is also well worth reading. Production of the daylight-balanced white light essential for most microscopy applications requires even more ingenuity, since LEDs typically produce only a single spectral band. 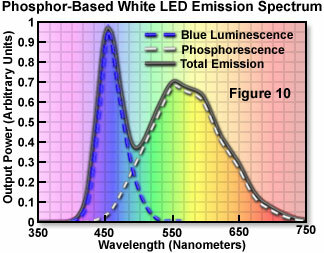 There are actually several ways in which LEDs can produced white-appearing light (summarized from the detailed but excellent Olympus Microscopy Resource Center article “Introduction to Light Emitting Diodes“). 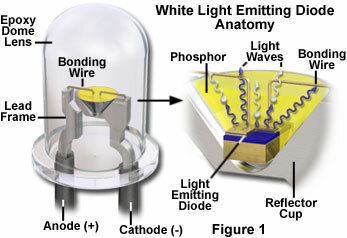 Other methods include LEDs where all of the emitted light comes from a mixture of phosphors and the blue source light is never projected from the device. Such devices can use phosphors already developed for fluorescent lights; unfortunately, this method has a much lower efficiency than the mixed microchip/phosphor emission technique. Instead of phosphors generating the longer-wave spectral elements, another group of LEDs in development employs a second semiconductor layer to absorb short-wave light and re-emit longer wavelengths. This combination of a current-driven blue LED feeding an optically-driven, longer-wavelength LED is known as a photon recycling semiconductor, or PRS-LED. In some cases, white light is generated by a three-LED RGB unit whose color can be varied by changing the current driving the red, green, and blue LEDs. By balancing the intensity of each LED, any color can be produced. HOWEVER, remember that, even though LED light may appear white to the human eye, it is still only an approximation of the continuous spectrum of white sunlight that floods Death Valley every afternoon. White LED light is still cobbled together from individual, discrete bands, with peaks and valleys that are not present in the continuous daylight spectrum. As such, supposedly white LED light may behave differently from true white light in certain microscopic techniques, or may render colors and stains differently. Chromaticity considerations are discussed in the Olympus LED reference. This site also has a good general discussion of visible light sources. The Zeiss web site also has a thorough discussion of light emitting diodes in microscopy. However, when these theoretical concerns are put to practical testing, as in David Walker’s excellent side-by-side comparison of slides viewed by tungsten light and illumination from a Phillips Luxeon III LED, the images looked almost identical, with the LED colors actually being slightly more vivid. Mr. Walker also discusses the significance of the color rendering index (CRI) in older and current LEDs. To my pathologist’s eye, the color differences are slight, and seem functionally insignificant. The more sharply curved lens on the left, positioned some distance from the microchip, produces a narrow beam that fails to fill the field of the objective, while the broader beam of the flatter lens to the right, positioned closer to the microchip, produces a wide field of very usable illumination. Images are from Mr. Walsh’s site; he unfortunately passed away in 2012, and his site is maintained by his friends. 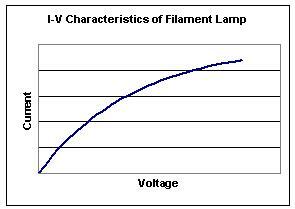 The graph would be a nice straight line if it weren’t for the fact that the resistance of the filament increases as it heats up. 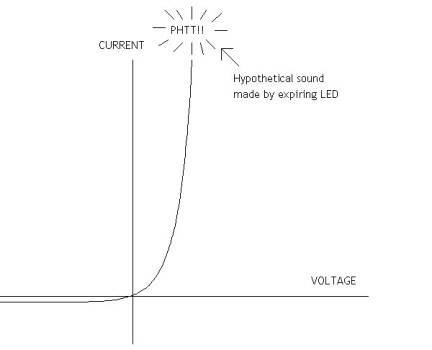 “…The relationship between current and voltage in an LED is non-linear. As the voltage increases from zero there is only a trickle of current and no noticeable light. At about a volt and a half … the current begins to increase appreciably and the first glimmers appear. The reason for this behavior is that the applied voltage increases until it forces electrons and holes over the energy barrier at the junction between the two different kinds of semiconductor (the n and p layers). Initially, nothing much happens until this threshold energy is reached. 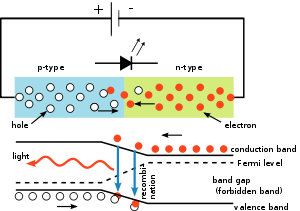 However, once the cascade of electrons begins, small increases in voltage result in a deluge of charge carriers across the junction and, like water eroding a dam, the LED can quickly be destroyed. Consequently, LEDs cannot be dimmed by increasing the voltage; instead, the voltage must be held relatively constant and, unlike incandescent bulbs, dimming is accomplished by varying the current through the LED. The water-over-the-dam analogy is really quite good. With the LED, imagine you’re filling up a dam; the water level rises and rises, yet nothing much happens. When the water reaches the top (junctional energy barrier), a trickle appears over the edge. A bit more, and there’s a nice flow down the spillway. A tiny bit more, and we have a torrent over the top that eats away at the dam and quickly washes it away. To control the amount of work done by the water behind the dam, we use the gate on the spillway to control the flow (current). Within limits, the water level behind the dam (voltage) can rise or fall, and we just open the spillway more or less to compensate. An electric light behaves more like water running through a V-shaped canyon – raise the level or pressure (voltage) at the beginning of the canyon, and more and more water flows through. The water level rises in the canyon as flow increases, but it is a reasonably steady and linear process. You will finally reach a point where the waters wash away the walls of the canyon or overflow across the countyside (the point where the lamp burns out,) but the flow has been a fairly regular progression up to that point. There are two ways of supplying power to an electronic gizmo: through a voltage source or through a current source. Most sources of electric power with which we are familiar are voltage sources: our 110V or 220V AC wall plugs, a 1.5V flashlight battery, etc. A 12V car battery can run a flashlight bulb for a week, or the starter on your car for a minute. In both cases, the voltage stays fairly constant at about 12 volts, but the current varies from a tiny trickle with the bulb to a hefty 100 amps for the starter. Putting the wrong gadget across the battery results in a shower of sparks (and a melted gadget) as the current soars and burns it out. This is a good example of a voltage source – the voltage stays pretty constant, but the current can vary enormously. This is how we usually think of electricity – we decide the voltage, and the current is just whatever is needed, up to the maximum capacity of the source. BUT – this is NOT what we need to keep our LEDs happy and unfried. 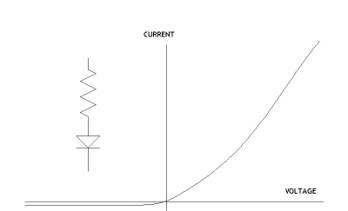 We are not used to stabilizing the current first and letting the voltage follow along; this is, however, the nature of a current source – a power source that provides a constant current regardless of the voltage in the circuit. Note that many solid-state power supplies are pretty happy with a range of voltages, and you can plug many electronic gadgets into 110 or 220V and they don’t seem to notice the difference. An electric welding power supply is a good example of a constant-current source, where the amount of metal deposited in the weld is a function of the current. Similarly, LEDs need to be powered by a source that, at the minimum, keeps current flow from destroying the diode, and ideally, allows the current to be varied in a stable and regulated fashion in order to control the light intensity. “…The usual approach is to put a resistor in series with the LED. The combination is still non-linear, but in a much more well behaved manner. In fact, over the range of safe operating current, it acts incrementally linear. The disadvantage of these very basic circuits is that they are inefficient and may not provide uniform dimming as the potentiometer is rotated. Better current control, uniform dimming capability, and less power wastage require a more sophisticated circuit. Searching the literature, as I did for a week, reveals a mind-numbing collection of complex circuits using operational amplifiers, integrated circuits with optical transistors, Zener diodes, etc., etc. Fortunately, when one understands its relatively simple needs, the LED is actually a fairly amiable and undemanding critter that is happy with a ham sandwich for dinner every evening, and doesn’t require champagne. However, it is a major project to find a simple, constant-current supply circuit with dimming capability for a single LED or small group of LEDs; many of the available circuits are meant for constant intensity lighting circuits or are designed for residential lighting. The two transistors, the MOSFET BD237/243 and the general purpose NPN BC546, are at present commercially available, and conversion datasheets are readily available for equivalent transistors. Let’s now turn (literally) to the nut and bolts of doing your own LED conversion. If you decide to design and build your own unit, there are a few references available on the internet. However, there are as yet no standard techniques for retrofitting incandescent illumination systems with LEDs. LED illumination systems are relatively new and rapidly evolving for all applications, including automotive and residential, and articles on retrofitting classic microscopes are scanty as of 2016. One important and as yet unsettled question is the number of LEDs in the light source. Where will the microscope industry land – with a single, high-intensity LED and lens, where one deals with the same problems of uneven center-to-edge brightness found with conventional lamp filaments, or with a multiple-LED source, which is more even between center and edge, but where one must strongly diffuse and evenly spread the light from several discrete sources? 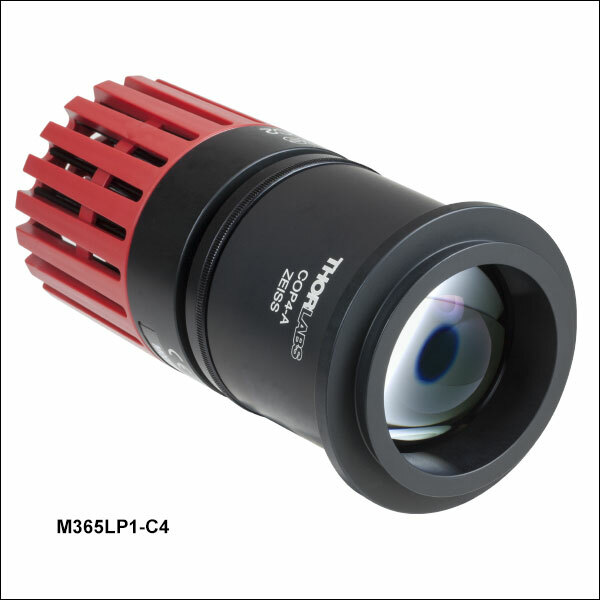 So far, the replacement illumination systems for binocular scopes with or without Kohler illumination capability have used high quality, high intensity single LEDs with focusing lenses. One new development that may have promise for producing a very uniform light source without the problems of evenly spreading light from a point source LED is COB, or “Chip-on-Board” technology. In this new design, multiple small microchip LEDs are arranged in an array to form a small, uniformly illuminated lighting panel. While many of the manufacturers are in China, American lighting corporations such as Cree Inc., headquartered in South Carolina, list a wide variety of small (1-4 cm) lighting panels using this technology. This new light source is only recently commercially available and has not yet been used in microscopy but has, I think, considerable promise. As of June, 2016, there are no online references on the possible uses of COB technology in microscopy. One question, to which I do not immediately have the answer, is how a small flat-panel source fits in with Kohler-type illumination and maximizing resolution. If the standard power supply can be modified, or a tiny converter supply built into the socket, this might allow conversion to LED without significantly altering the microscope. A similar mounting of an LED onto a microscope bulb base has been described by David Walker. The above sites provide details of professional-level conversions. There is also a place for simple and inexpensive solutions using local materials, similar to spending $5.00 on a cheap dimmer to rebuild a Nikon S illumination system (see Part I). The cheap and readily-available LED flashlight may prove a simple fix for illumination problems. When my Nikon S illumination system failed, I removed the lamp and inserted a cheap (10 for $12.00 at the thrift shop) seven-LED flashlight that fit into the lamp housing. Without a good diffuser, it was nothing that I would use for photography, but it worked and the scope was usable on an emergency basis. A very simple conversion of an American Optical 150 microscope into a portable scope, using an off-the-shelf LED powered by a 9V battery, was published in the November 2011 issue of Micscape magazine by Bill Resch. The LED was clamped in place and supported on its two wires in the same place as the lamp filament. Bill’s published images suggest that the illumination was quite even. In the March 2011 issue of Microbe Hunter magazine, Suphot Punnachaya described a simple LED conversion of a Chinese microscope’s halogen illumination system using an LED array obtained by sawing off the front inch of an inexpensive LED flashlight. Power was supplied by an old cell phone 5V “wall wart” charger connected to the LED through a series resistor and rheostat. An even simpler conversion of a Zeiss Gfl scope was describe in the August 2013 issue of Micscape by Franz Schulze; this used a $2.00 single-LED flashlight with lens, purchased from the Dollar Store. The flashlight was mounted in a simple wooden sleeve machined from a wooden dowel, and placed into the port for the lamp assembly. It should be noted that microscopes such as the Zeiss Gfl and the Nikon S, where the bulb assembly is inserted into a port or sleeve in the body, are easiest to convert to LED illumination. Those models where the bulb is enclosed inside the base require somewhat more work, ingenuity and removal and remounting of components. In these cases, assembly and mounting within the base might be further simplified by using a hot glue gun to mount components (or the LEDs themselves) rather than machining clamps. Powering the LED illuminator can be as simple as using coin, flashlight, 9 volt, or rechargeable batteries, since the power requirements of many LED sources are low enough that batteries are a viable option. 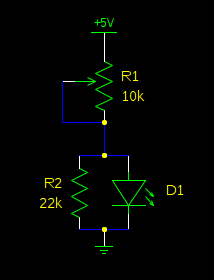 The need for a series resistor is described above. This is probably the simplest option for setting up an LED supply within the base of a microscope. One might consider combining the small dimmable LED driver with the guts of a cheap dimmer, the latter replacing the microscope’s illumination control and the rest of the dimmer’s circuit components being transplanted as a unit, as described in Part I. However, you might be better to buy a small dimmer unit matched to the LED driver from the same supplier. As far as building your own LED power supply from scratch, you can do it if you are more familiar with modern electronics than I am. Yet in these days of mass-produced circuit boards, this seems like unnecessary complexity. Browsing LED driver circuits online resulted in many pages of complex diagrams using integrated circuits, MOSFETS, small inductors, etc., etc. I have a PhD, and I felt lost and frustrated. This seems like a lot of work when I can spend $10-20 and buy a smaller and better-made driver from any one of fifty electronic supply houses, then add on a simple dimmer circuit and figure out how to situate it all within the particular configuration of the microscope base..
One more thought – the power supply for your microscope’s new LED system may be sitting right in your desk drawer. Or in a box your neighbor’s garage. Or at your local thrift store. For the last twenty years, orphan power supplies for all kinds of outmoded electronic gadgets have been piling up in boxes and drawers and finding their way to thrift shops. Your local computer service store may have a box of disused power supplies in their back room in various voltages. Some of these are wall warts, while others are inline supplies. These originally powered computers, printers, cell phones, zip drives, makeup mirrors, cordless phones, games, and multiple other devices that need low voltage DC from a wall socket. Now, remember that these small power supplies are voltage sources and are of two types: SMPS and linear. Most of the newer supplies will be switch mode supplies (SMPS) that convert, reconvert and regulate their low-voltage output, with light, high-frequency transformers (see SMPS discussion in Part II). The older, bulkier units are usually very simple 60Hz linear supplies, with bulky, low-frequency 60Hz transformers. You can tell the difference by just hefting them in your hand; SMPS are very light, while transformer-based linear supplies are quite heavy. To convert either to a usable current-based power sources, one can employ either a basic resistive network or a simple current regulating circuit such as that described by Frank Weithöner (see above). It may also be helpful to Google something like “LED supply from wall wart.” This will bring up multiple posts with ideas of varying usefulness from electronic hobbyists. John Bryant’s “A Dummies’ Guide to Working With Wall Warts” is helpful, though it focuses more on voltage than current sources. I have not cited any others specifically, as they change on an almost daily basis, but they can have interesting ideas. Genuine iPad wall wart versus cheap copy. The fewer components in the fake iPad supply reflect the lack of regulating and protective circuits. Notice that the large ground post in the copy is probably plastic and, unlike its metal counterpart in the real iPad supply, does not seem to be connected to anything. Do not dismiss the big, heavy, 1980s-1990s wall wart. Though they are older, heavier, and clunkier, the old linear wall wart of any brand with its heavy transformer is probably safer than any cheap modern SMPS supply. The big transformer serves as an isolation transformer, preventing the user from directly connecting with line current and risking a serious shock. A good SMPS is a complex device with safety and isolation features built in, but a cheap switch mode supply with all the safety circuits left out, no ground, and possible internal shorts will still function, and you can’t tell the difference from outside the case. Whether you use a purchased, ready-made LED driver or put together a supply from inspired scrounging of bits and pieces at the thrift store, this can be an inexpensive but creative project. LED illumination technology is in its infancy, and new products are becoming available every day. Consider the conversion a challenge to your inventive talents! Or, if you just want to plug in a storebought box with a cord on one end and an LED on the other and get back to chasing Peranema, that’s fine too. If either approach helps you to fix your dead scope or restore a classic beauty, it’s worth it. 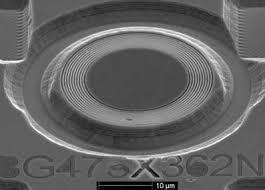 Note on best general references: The Micrographia site has a good general discussion of microscope illumination, including thoughts on optimal LED design for microscopic illumination. The ZL2PD Amateur Radio web site has an excellent basic discussion of switch mode power supplies. The Olympus Microscopy Resource Site is a very good overall resource on microscopy, with a superb article on all aspects of LED function. The Zeiss site Fundamentals of Light-Emitting Diodes (LEDs) is also very well-written, informative, and dense with information, especially with respect to LEDs’ potential role in fluorescence microscopy. I have tried here to summarize just the information necessary for a general microscopist’s working understanding of this new technology. Part IV deals with the physiology of the eye as it pertains to the many unresolved questions regarding LED safety. Intelligent Controls pamphlet, accessed March 25, 2016. “How a Dimmer Works.” http://www.ilight.co.uk/downloads/iLIGHT%20Binder-HowDimmers.pdf.